At Chester County Eye Care, our experienced LASIK surgeon, Dr. John DeStafeno, offers the revolutionary 100% Blade-Free LASIK—a safe technology that provides the most effective and accurate results. Whether you have nearsightedness, farsightedness, or astigmatism, Dr. DeStafeno will work with you to achieve your best vision outcome. With our 0% financing options, there’s no reason to wait. Contact us today and get on the path to a life less dependent on glasses and contact lenses. 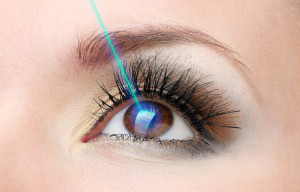 With blade-free Wavefront LASIK, this popular laser vision correction surgery is more safe and precise than ever before. Chester County Eye Care offers this innovative technology to our patients to ensure a higher level of safety and the best possible vision outcome. LASIK surgery is done as an outpatient procedure and takes about 7-10 minutes per eye, though you can expect to be at the surgery center for about 2 hours. Topical anesthetic eye drops are applied so you feel little to no pain or discomfort. During surgery, the LASIK surgeon uses the most advanced laser technology, the Wavelight® FS200 laser, to create a thin flap in the cornea. The cornea flap is then lifted up, allowing another state-of-the-art laser, the Wavelight® Allegretto excimer laser, to reshape the cornea for the actual correction of vision. The eye will heal naturally without the use of stitches. Safe and virtually pain-free, LASIK has a quick recovery time with most patients experiencing improvement in vision within the same day or by the next day. If you’d like to find out if you are a candidate for LASIK or other laser vision correction procedures, call us at 610-696-1230 or contact us online to schedule a consultation.